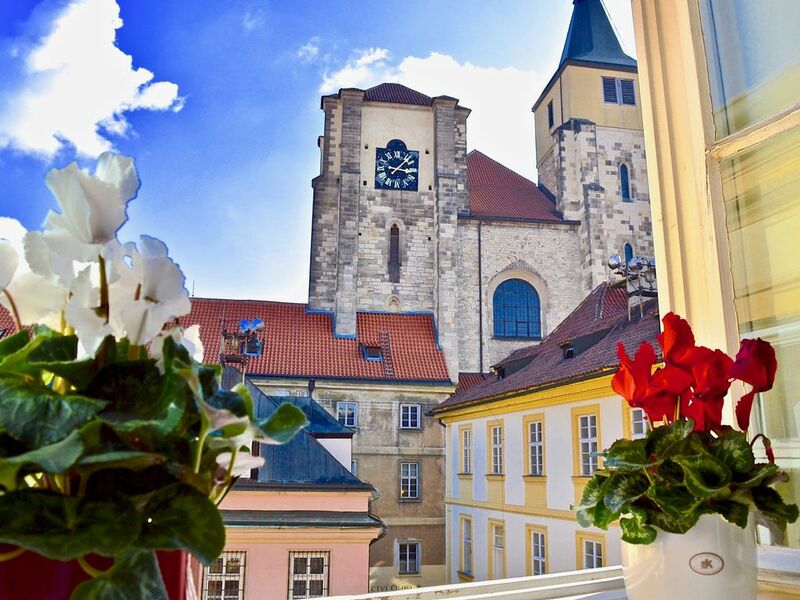 This elegant apartment is located in a historical house at the very heart of Prague Old Town. Hidden in a private court and surrounded with a private quiet garden in one of the city’s Oldest neighborhoods. Old Town represents the medieval heart of Prague. It’s no surprise it is bustling with tourists every time of day. This apartment nestled in a private courtyard is the perfect place to escape the crowds. There is a jazz band which plays in the restaurant in the courtyard but they obey strict noise laws and shut down at 10 pm at night. Whether you are a couple or a group of four this large spacious apartment area of 1001 squ feet, 94 squ m really allows our guests the chance to spread out in comfort and style. A spacious entrance hall, separate modern kitchen with a dining corner, a bathroom with 3 windows, an additional toilet and two large, sunny rooms offer a high standard of comfort with a view of the courtyard and St Giles’ Church above it. This tastefully decorated Prague apartment in the heart of Old Town is fitted with all modern comforts. A fully fitted kitchen (a hotplate, a microwave, electric kettle, a coffee machine, a toaster, an oven, a dishwasher, a washing machine, a TV set, a DVD player and Free Wi-fi. Once in the apartment you will be struck by the beautifully restored original features, natural light, elevated by its beautiful positioning on the corner of the house as well as views from all windows over private courtyard and to St Giles Church. The apartment is positioned on the second floor if an immaculately maintained building. The building does not have an elevator but with just two flights for stairs to climb this should not present any discomfort. This is an exceptionally large one-bedroom apartment. The extra space adds a great deal of extra comfort to spread out in. There is a lot of natural light which streams through the window into the hall and living room making this a delightful choice for couples or families. The location is in the very heart of Old Town with all attractions walking distance. The extra space (90 squ m/1001 sq feet) decorated with elegant vintage furnishings, is a real pleasure to relax in. There are views from the windows of st Giles Church and also a private garden ideal for enjoying a coffee in the morning in tranquil surroundings. The location in Prague most sought after area of Old Town (stare Mesto) simply could not be more central allowing easy access to all major attractions by foot. Filter coffee maker and French press. MAGICAL & CHARMING...best anniversary EVER! This was our 4th anniversary trip and this property was soooo charming. It was beautifully decored , the views to the church tower, right on old town and everything was accessed by walking distance. Ilan, our host, checked us in personally, he even took us to the parking facility so we would not get lost. He explained all our amenities and made sure we were left ok in the premises. He also gave us lots of tips in dining and everything we had in our surroundings. I have stayed in many vacation homes and this by far is one of the best. They truly made our anniversary special. So if you want to explore Prague you should definitely contact them. They have various apartments throughout the city from one bedroom to three. Check them out ! Had a wonderful romantic getaway in this apartment. it was, large, bright, spacious and perfectly located for our short break. Our taxi transfers were arranged without a hitch and we were given a host of excellent restaurant recommendations and local tips on arrival which helped make our short break extra special.. I would absolutely book again. Thank you. The apartment is pretty nice, huge and it feels comfortable. The facilities is complete and at one point I need scissors and there is one! There's an extra toilet and the bedroom, living room and kitchen are divided into its own section. Wifi is great! and a towel warmer! There's a church across and the Old Town square is very near. One time we were at Old Town square and it rained, I left my wife at one spot and I rushed to grab an umbrella from the apartment. It was really that close. There are groceries and a Shopping mall too near (around 2 North American city-blocks far) and you can grab and cook your own breakfast at this apartment. I also brought bottles of water, beer, cheese, eggs, bread and all the stuff to make our 3-day stay perfect. The Charles Bridge is so near that we were able to go there at the start of the day (Sunrise) and we enjoyed that there were only a few people there. We only have to spend 24-hour transit pass (the day we arrived) coz everywhere is near. Departing was easy too as the owners can arrange car pickup from there to airport. For starters the location was right in the heart of the Old Town with easy access to everything. The accommodation space was generous and comfortable. All of the facilities we needed in an apartment were available for cooking, cleaning and washing. We were met and given all of the helpful information we needed. Good value for money, really enjoyed the stay. If you're looking for a wonderful location to experience all Prague has to offer this place is ideal. From the moment we booked several months ago we received exceptional service from Ilan and Veronika. They were incredibly timely and helpful in their responses. Ilan was waiting for us when we arrived and was very thorough with everything, up to and including offering several recommendations. The location itself it literally a 2 minute walk to Old Town Square. The apartment was very roomy with separate kitchen, bedroom, living room and bathroom. It also has a washer and dryer which helped as we had been on the road for a week before arriving. Our only complaint is we had to leave! Ilan even set up our departure travel to the airport which we needed at 3:50AM. The driver was right on time and everything went off without a hitch. Can't say enough about the service, location and apartment itself. What a wonderful experience we will forever remember. Thanks Ilan and Veronika, we had a blast. This elegant apartment is located in a historical house at the very heart of Prague Old Town. Hidden in a private court and surrounded with a private quiet garden in one of the city’s Oldest neighborhoods. Old Town represents the medieval heart of Prague. It’s no surprise it is bustling with tourists every time of day. This apartment nestled in a quiet courtyard is the perfect place to escape the crowds. Once you decide to explore what this magical city has to offer you will find all sites within easy walking distance. Old Town square with Astronomical clock, the Jewish quarter and the Charles Bridge and just 5 min walk away as well as the Old Town metro and Tram stops. Křížovnický square, a few minutes away overlooking the Charles Bridge with Prague Castle in the background, is probably the most beautiful square in the city. Its unique historical atmosphere of gothic houses and churches, cobblestone streets and squares, and stone towers blend together with the modern era. A vast array of bars, restaurants, dance clubs, international brand shops, galleries and hotels bring life to the old city. With its charming and picturesque cobblestone streets, this location is sure to leave our guests with unforgettable memories of one of Europe’s most magical and beautiful capitals.